WMSPanel agent works closely with Wowza server so we literally feel its pulse. That's why one of the first features was server offline/online notification. Moving forward we got requests from customers asking for the same for incoming RTMP streams monitoring. Basically people need to know when the stream becomes un-available and get notified about that. Having been notified about RTMP publish or unpublish event, we can inform a customer about the failure or recover. This kind of events may happen very often, especially if you have thousands of streams. That's why using email is inappropriate in this case. That's why we implemented this as a push API. Create a processing script on your web site and check its availability. Add a processing script URL in WMSPanel. Having those steps complete, you'll have the script is automatically called each time our agent gets publish or un-publish event from all servers registered in WMSPanel. Let's go step by step to see what you need to do. WMSPanel, админская панель для сервера Wowza, делается командой из России. Поэтому когда мы решили сделать поддержку разных локализаций, мы начали именно с русского языка. Сегодня мы запускаем первую международную версию WMSPanel, на русском. По адресу https://ru.wmspanel.com/ можете ознакомиться с описанием возможностей по управлению сервером Wowza, построению отчётов и контролю доступа к медиа-ресурсам. На нашем канале YouTube можете посмотреть скринкасты с освещением основной функциональности панели. Чуть позже туда добавятся новые ролики. 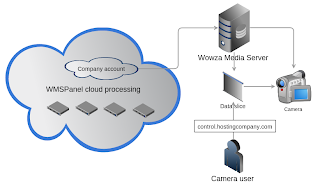 WMSPanel gathers data from hundreds of Wowza servers and processes data about hundreds of thousands of streams. So having the service that must be reliable and available 24/7 we improve our robustness all the time. From the very beginning we use cloud hosting and this allows easily scaling our computing resources in order to make them more reliable. But every virtual cloud hosting is based on some hardware. And we know that every hardware fails sooner or later. So there are several way to dodge it. We use several virtual servers for each specific part of data processing and storage. As example, we have 2 virtual servers which process sync packets coming from customers' servers. Each virtual server is located at different hardware unit. Thus the load is spread across 2 machines each having 4 CPU cores. So even if the load increases and at the same time one of servers fails at one of the physical hardware units, we'll have enough computing power at different physical instance to handle incoming requests. And we can easily bring up more servers to keep up the processing. The same applies to UI processing. Each incoming request from your browser goes to load balancer and the is forwarded to either of 2 servers that work as front-end. So regardless of the load and the availability of any of those servers, we always have some entity which will respond when you browse the statistics reports. All other part of our system are designed the same way to make less points of failure. There was just one part which did not have its "hot backup". It's a load balancer. If it failed, we would be in deep trouble because every request from either web browser or Wowza agent goes through it. We decided to use DNS failover based on multiple DNS A records. Those records point at 2 identical load balancers which then normally route the traffic according to its target. WMSPanel has 2 sources of incoming requests: users' browsers (both PC and mobile) and Wowza servers agents. Let see what happens in case of failure of the load balancer at the primary IP which is set up in DNS record. A browser will just try secondary IP as it should have it in the local DNS cache. So this will work seamlessly for the end user and it's a default behavior for all web browsers. In the same situation the Wowza agent will work the same way. It will check DNS for secondary IP and send its sync-ups over there. Note that you need to have an agent version at least 1.3.0.0 to handle it correctly. There may be more than just two DNS records so when we need another balancer, even located in the different data center (e.g., Latin America or Asia), we'll just add a new record there and it will work perfectly. Read a complete blog post about WMSPanel architecture and design to see how we provide high availability and robustness, with DNS failover being a part of it. If you haven't yet used our service, don't wait and try it now for 2 weeks free of charge. White label branded panel with customer domain and logo. This video does not cover our latest streamed slices yet, please read blog post about how you can track individual streams statistics. You may also specify time zone for a slice. Did you like the concept? Sign up today for free trial. 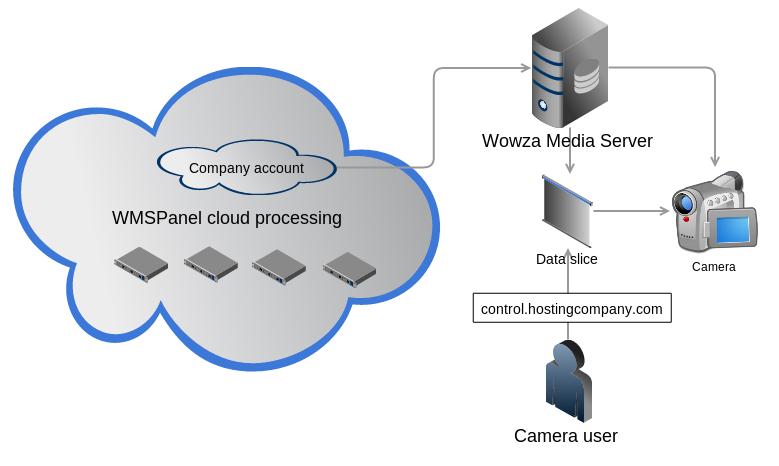 A number of our customers were requesting an ability to control Wowza streams via single control panel. Most of them are using MediaCaster, so our Wowza control panel must know how to deal with it. And so we made an implementation. Use excellent dynamic user experience of WMSPanel. The best known cases for this feature set are camera streams and transcoder streams control. A lot of people use this to manage ShoutCast relay streams as one of other examples. Using traditional MediaCaster control requires manual log in to each of the servers which is not always possible due to security restriction. Now you can allow this operation for your clients who can control their streams via your servers. Controlling camera stream via WMSPanel for Wowza. This feature set works on all versions of Wowza including 2.x.x, 3.1.x and 3.6.x. For Wowza versions 3.1.2. * and earlier recording feature has some pre-requisites. Read this post to know more. This feature has 2 sides: administrator set up and end-user control. As our data slices concept is being used by larger number of customers, they face the need for extending user permissions settings for their accounts in WMSPanel. We have 2 kinds of users. Admins are allowed to install the agent for Wowza server, add it to the panel, define data slices and add users for their customers there. They also are able to manage servers and set up connections restriction. Users are allowed to see a variety of reports just for the slices which they are allowed to see. An admin may create a new user for a data slice in 2 ways - create as new and assign existing user to a slice. Entering new user is simple. Being in data slice details page, just type user email and password and then click on "Create user". Managing users of selected data slice.